The NBT50L Series offers a 151-ft. boom and a maximum tip height of 158 ft. With the added reach, there’s less of a need to swing a jib on the job site. 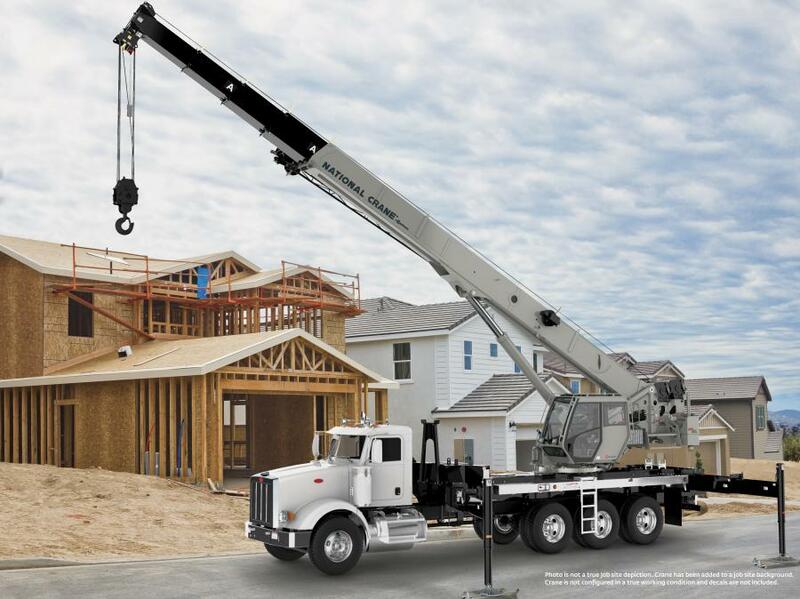 The new National Crane NBT50L Series of boom trucks offers a longer reach than the original NBT50 Series. The NBT50L Series offers multiple configurations for maximum flexibility — each machine can be set up with a 50-ton or 55-ton rating and be configured to operate as an NTC truck crane/boom truck hybrid. NBT50L Series boom trucks are the first National Crane machines to feature an offsettable lattice jib. Manitowoc has introduced the National Crane NBT50L Series of boom trucks at Crane Days 2018 in Shady Grove, Pa. The new line of cranes is an update to the popular NBT50 Series, adding more boom length for increased versatility on the job site. Visitors to Crane Days are the first in the world to see the next-generation boom trucks in action. The NBT50L Series offers a 151-ft. boom and a maximum tip height of 158 ft. With the added reach, there's less of a need to swing a jib on the job site. This saves time for the end user, enabling them to get more work done in a single day by increasing their efficiency. The new boom truck series also features a 36-ft. offsettable lattice jib, a first for National Crane. According to Bob Ritter, product engineering manager for boom trucks at Manitowoc, the cranes' design is a prime example of putting The Manitowoc Way into action, as Voice of Customer (VOC) research was crucial to the design process. There are four models in the NBT50L Series: the NBT50L, NBT55L, NTC50L and NTC55L, the second of which is currently on display at Crane Days. As the model names denote, these cranes are available with a 50-ton or 55-ton rating, and they can be configured to operate as a model NTC, a truck crane/boom truck hybrid. When configured as an NTC, the crane has four distinct outrigger setups, including an exclusive, 20-ft. “truck crane” footprint for tighter job site requirements. All cranes in the NBT50L Series offer a working capacity of 10,000 lbs. when the boom is fully extended at an 35-ft. radius, making them the new leaders in their class. The NBT50L Series benefits from a new superstructure design that has been optimized to reduce deflection, offering not only higher lifting capacities, but greater operator confidence while lifting. Other new features include a 20° hydraulic tilting cab, removable counterweight system, internal anti-two-block wiring and the exclusive 36-ft. offsettable lattice jib. A two-camera system for operator visibility and a wireless wind-speed sensor for lift planning are also available as options. A special NTC Value Package is also available for customers, which includes the four outrigger setups, two-camera system and wind-speed sensor all in one convenient bundle. The Manitowoc Way increases the velocity and innovation of new cranes, and in the case of the NBT50L Series, its maintenance functions represent a step forward, as well. The new boom trucks have onboard, real-time diagnostics for all electronics; external CAN cables and junction boxes; and easy-access hydraulics, all of which combine to make the NBT50L Series the easiest National Crane boom trucks to service yet. In addition to the NBT50L Series, Manitowoc is showing a wide array of its latest National Crane models at the event, including the NBT40-1, the NBT30H-2 and the NTC55.